Teaching students how to “do science” using the old, linear scientific method is not truly reflective of how scientists study the world around them. 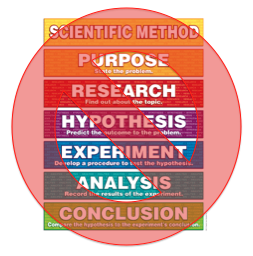 The scientific method gives a false sense that there is a step-by-step process for how to approach research, including moving from analysis to conclusion without ever reinvestigating, retesting, and revising. Science learning is not a rigid process, it is much more fluid. What is a closer method for teaching science? Inquiry! Sometimes I think this word is used so much that it no longer sounds like a real thing. Inquiry is simply an act of asking questions to gain information. Science education researchers have been looking into how inquiry fits with science learning since the early 1960s when Bob Karplus and J. Myron Atkin published a paper based on “guided learning” or more known as the Learning Cycle (Rebello & Zollman, 1998). Guided learning focused on exploration, invention, and discovery, and was mostly used at the elementary level. Over the next 30 years, educators noticed the lack in formal reasoning skills among secondary and collegiate level students so began applying the learning cycle at the upper levels as well. There have been many different models developed but all are based on the original learning cycle. One of the more common models used at the secondary level for science education is the Biological Sciences Curriculum Study (BSCS) 5E Instructional Model (5Es) lead by Rodger Bybee in the 1980’s. 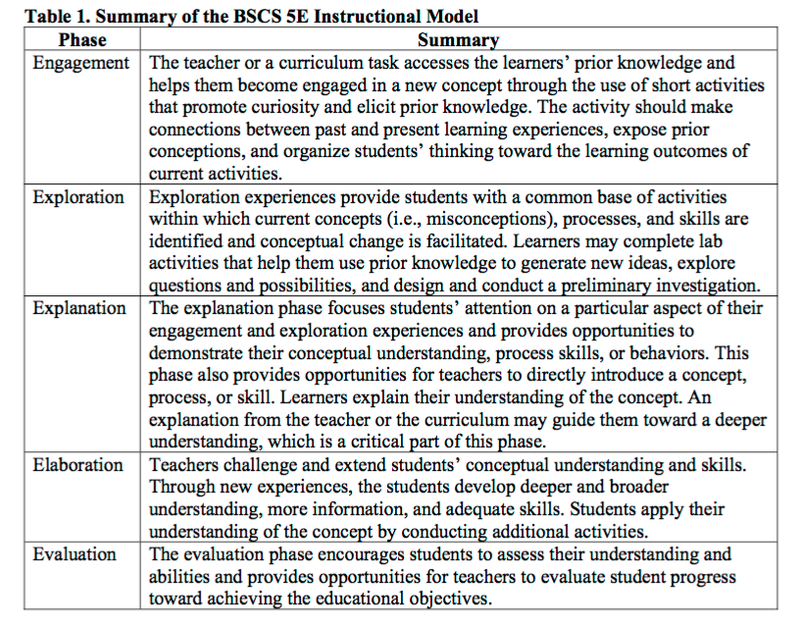 The BSCS 5E Instruction Model consists of 5 phases that all begin with “E” (imagine that 🙂 ): Engage, Explore, Explain, Elaborate, and Evaluate (Bybee et. al., 2006). See the diagram below for more information about each phase. Inquiry has been a part of science education for a very long time. So why aren’t more teachers using it? This is a complex problem with many answers ranging from the focus being on testing for the last 10+ years, lack of professional development showing HOW to apply inquiry (so much PD and college courses focus on the process of inquiry not specific science applications), lack of planning time for teachers to really think about applications in the classroom, and maybe even the worry that students won’t really learn everything they need to without explicit instruction. The 3-dimensions of science learning are disciplinary core ideas (DCIs), crosscutting concepts (CCCs), and science and engineering practices (SEPs). What’s with the colors? Well our standards are color coded for easy understanding! (A dream for this visual learner!) 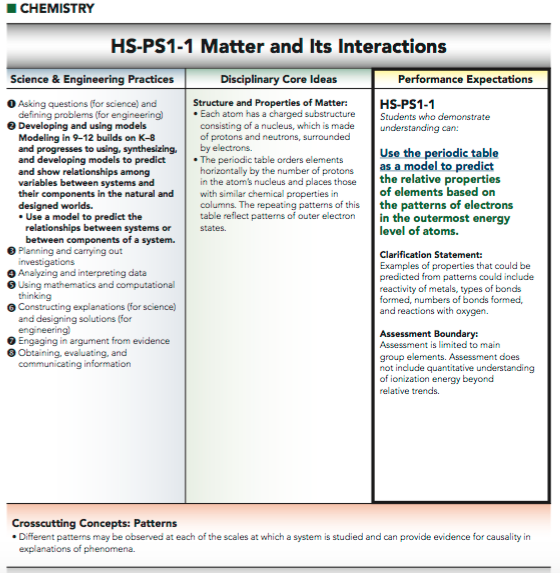 As you can see in this screen shot of the first chemistry standard from the Oklahoma Academic Standards for Science (OAS-S), each section is colored. These colors are related to many things that are associated with our standards (Science Frameworks, PD on Your Plan, Lesson Adaptations – coming soon!). The standard that students will be assessed on can be found in the Performance Expectations (PE) section, which happens to be color coded as well. The blue part is associated with the specific SEP students are expected to be able to do, and the green is associated with the DCI. The CCC listed below is what will help students understand how it’s connected to other ideas (in this case it’s patterns). So how do I get all of these colored pieces into inquiry? Well I’ve learned to group the 3-dimensions around gathering information, reasoning, and communicating (using Brett Moulding’s book, A Vision and Plan for Science Learning). I’ve also learned about phenomena-driven instruction and have become a huge fan. I’ve taken all of this and have decided to frame my teaching around the following phases: Phenomenon, Investigation, Explanation, Modeling, and Communicating. This is how I’m going to teach my classes this year. Are you a visual learner like me? Below you’ll find a table that represents how I believe the 5E Instructional Model, Moulding’s “Gathering, Reasoning, Communicating”, and the phases I’m going to use in my classroom relate to each other. This is definitely subject to revision as I work during the year. My current ideas behind how inquiry and the 3 dimensions of science learning intertwine. Now please understand this is not meant to be a linear process that simply replaces the old version of the scientific method! Gathering, reasoning, and communicating could really be done at any phase (reason behind no separation lines in that column). These models are fluid and students can move between phases in a cyclic fashion by reinvestigating, retesting/re-experimenting, and revising. This list is also more for teacher use than my students. My hope (and plan) is that each of my students will know what those words mean (from the “My Classroom” column) but they will not think of it as a step-by-step process. I want them to know that scientists observe, question, investigation, construct explanations based on evidence, and communicate with others. Okay, time for an example. This will be from chemistry since that’s what I teach but hopefully you’ll get the idea 🙂 The 5Es I used in this lesson are in red, just to distinguish sections. This lesson is a little snippet from the one I actually wrote (the other one is longer and I didn’t want to write that all out. Although if you’re interested just let me know and I can email it). Construct an Explanation from Evidence: Using the evidence obtained during the investigation, students begin constructing explanations for the causes of different colored fireworks. Conduct a Class Discussion: Questions to initiate class discussion: What are the mechanisms for a firework? How is an atom structured? What subatomic particles are involved and why? etc.. Develop an Argument from Evidence: Students individually develop an argument for how evidence from the investigation supports their explanation for how and why there are different colored fireworks. So the above is a portion of a lesson overview that I wrote using Brett Moulding’s set up from his book. They take some time to get used to and even Moulding said that it would be impossible to write all lessons like that. The important part is that you set up your instruction in such a way that students are applying the concepts they must learn when they are first learning about it, NOT at the end after a teacher-led discussion. If you are set up learning so that students can see the use for the information they will do it! As with anything, you’ll need to give yourself time to adjust as well as time for the students. Student-led learning is out of their comfort box as well, and they’ll definitely push back. Just. Keep. With. It! I promise it’ll all work out. I’ll end with an encouraging story: I had a student who struuuuuugled with writing explanations supported by evidence. This student preferred to just plug-and-chug problems and answer questions that just needed a one or two word answer (and this student did great with those!). This student worked hard, had set backs all semester, but kept working. When it came to finals, this student wrote the BEST short answer explanations out of all my classes! This student could see growth and was excited! This student is why I’m changing the process for all my classes so that there are repeats of this experience. I know it’s going to be hard and it’ll take time but if all of my students have the chance to feel like this one, why wouldn’t I?